In the popular film, “Night At The Museum”, all the animals and characters in the exhibits come to life. In the Smokies next week, another museum will come to life when the Mountain Farm Museum hosts the annual Mountain Life Festival. 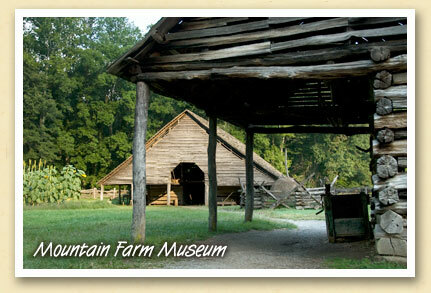 The Mountain Farm Museum is a collection of 19th Century farm buildings moved from different sites throughout the Great Smoky Mountains National Park and assembled in a grassy field alongside the Oconalufee River near Cherokee. Throughout the summer, the museum is a sleepy 19th century farm, with crops such as squash, corn and tomatoes cultivated in the garden and live farm animals grazing in the fields. And on September 18, the farm will come to life with live demonstrations of soap making, hearth cooking, hominy, apple butter and cider, plus a working cane mill and wood-fired cooker used for the making of sorghum syrup — activities that typified rural life in the Smokies during harvest time.